For information on special events, please contact the Exeter Chamber of Commerce, info@exeterarea.org, 603-772-2411. 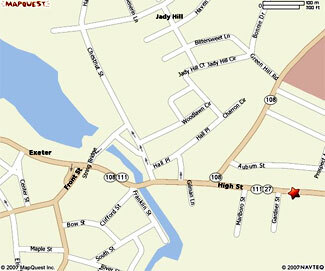 Around the Corner is located on 72 High Street in Exeter, NH and is easily accessible from Route 101 (exit 11). High Street is also called Route 27 and Route 111, and is a continuation of Water Street in downtown Exeter. We are 3/4 of a block east of the intersection of High Street (27) and Portsmouth Avenue (108). For an interactive map, input your starting address and click Get Directions for Mapquest's interactive maps and step-by-step driving directions.